Brevard, North Carolina is a unique community with many amenities offered in larger cities as well as many that the larger cities can’t offer. You’ll find the world renowned Brevard Music Center, Brevard College, and Transylvania County Arts Council. Brevard is primly located at the foothills of the Blue Ridge Mountains, and near the Blue Ridge Parkway, Pisgah National Forest, DuPont and Gorges State Parks. It is also conveniently located close to Asheville, Hendersonville, Atlanta Georgia, and Greenville South Carolina. Brevard is a great place to live, work, and play. One reason that makes Brevard so great is the climate. We have four distinct seasons however they are all usually very mild. Close to 50% of Transylvania County is owned by State and Federal governments for recreational and park use such as World Renowned trout fishing as well as hiking, kayaking, mountain biking and camping. Brevard is also home to the White Squirrel and the famous state of the art brand new multi-million dollar Transylvania County Library. Come to the Mountains of Western North Carolina and find yourself surrounded by a natural paradise! Brevard and Transylvania County is home to many great communities like Connestee Falls, Glen Cannon, Deerlake Village, Knob Creek, Williamson Creek, Whiskey Creek, Chasewood, Sherwood Forest, Eagle Lake, French Broad Place, Sylvan Heights, Stone’s Lake, Steel Creek, Glen Laurel Preserve, Straus Park, and Poplar Crest just to name a few. Exit Mountain Realty specializes in all aspects of Brevard NC Real Estate all most as much as we do the mountain lifestyle. We handle Brevard NC Homes For Sale. We can assist you with any of the Transylvania County NC Real Estate, View Lots for sale and Golf Course Lots for sale, Luxury Homes, and Mountain Homes. Are you looking to buy the perfect retirement home or mountain getaway in a retirement golfing community? Call the Brevard Realty Team at Exit Mountain Realty and experience the smooth low stress buying experience you are looking for. Our professional staff of experienced Realtors can handle all of your Real Estate Investment needs as several of them are experienced investors themselves. Exit Mountain Realty is a Real Estate Company handling homes, vacant lots, large acreages and farms, and commercial properties. Looking for a cabin in the woods? A retirement home on the golf course or lake? A villa or condo in town? We specialize in helping people find the home of their dreams. While our office is located in Transylvania County, we have listings all over Western North Carolina. When you think of North Carolina Real estate, think of Brevard, North Carolina, and the Associates at Exit Mountain Realty. 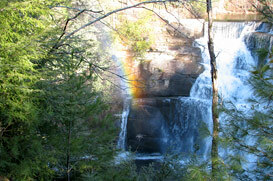 Special Thanks to Lori Jacques for the use of her beautiful waterfall rainbow photograph!